Four years ago, forward Keita Bates-Diop was preparing to begin his Ohio State career along with a highly touted recruiting class. The second-highest ranked member of the Buckeyes’ class, Bates-Diop came in with lofty expectations along with the other three players that were expected to form the core of a championship contender. They were coming to a team that had just lost in the first round of the NCAA Tournament, but had just made it to six straight tournament appearances. 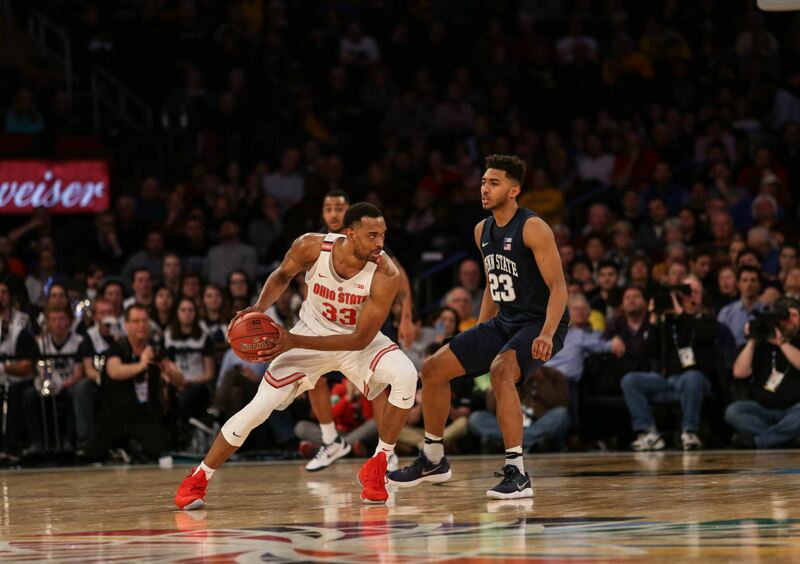 But, on Monday, as the redshirt junior forward sat at the table in the media room of the Schottenstein Center announcing he would leave the team early for the NBA draft, he reflected a tumultuous time in Columbus. One that began with promise, stalled out and returned to prominence in what became his final season in scarlet and gray. Though that 2014 recruiting class never came all that close to leading Ohio State to a championship, it laid the foundation for a strong program in the beginning of the Chris Holtmann era at Ohio State. The class itself each had members go in varying directions. Dave Bell transferred after his redshirt sophomore season at Ohio State, D’Angelo Russell left after one season to become the second pick in the 2015 NBA Draft and both Bates-Diop and Jae’Sean Tate stuck around for four years. Tate was always a consistent presence for Ohio State. He never became a star for Ohio State, but he remained a steady leader for the team. Bates-Diop was not necessarily that player. He was the 29th-best player in the class, but struggled in his first season before beginning to flash his tools in the sophomore season. Right when people began to view him as a potential breakout candidate, he fractured his leg and didn’t to return to action. Instead of playing through the injury, he opted to undergo surgery and take a medical redshirt for the season. In hindsight, that was the best decision he made during his time at Ohio State. “I could’ve played through it, but I don’t think I would be here today if I had,” Bates-Diop said. Holtmann said coaches talked with him before the season about how Bates-Diop had the tools to become a standout player for the team. The only questions they had were in regard to his motor and his toughness. But as soon as Holtmann had time to work with him, he said he could tell Bates-Diop had a strong enough work ethic and desire to improve in order to turn himself into a great player. Even with the potential Bates-Diop had shown, the hype was no longer surrounding him three years after he began his Buckeye career, especially coming off a season-ending injury. If there was any narrative around Bates-Diop heading into his redshirt junior season, it was that he would be counted on by a brand new coaching staff to provide solid production in the hopes of keeping the team afloat in the Big Ten. Instead, he became a star for the team, claiming the Big Ten Player of the Year honors after averaging 19.8 points, 8.7 rebounds and 1.6 assists per game. Though still not becoming the vocal leader in the locker room that Tate was, Bates-Diop led the Buckeyes by example and was the star Holtmann needed in his first season to prove to potential recruits he can maximize a player’s talents. Tate and Bates-Diop, the final two members of the 2014 class, will depart Ohio State both having gone through some ups and downs for the program. Both played key roles in helping turn what could have been a rebuilding process into a quick rebound and lay the foundation for Holtmann to build upon. “The good ones here that we recruit as a coaching staff will all realize that they stand on the shoulders of those really good players that came before,” Holtmann said. “And I think he realized that and so did JT, and that’s why I think they felt an obligation in a lot of ways to kind of put this to make the program relevant again.